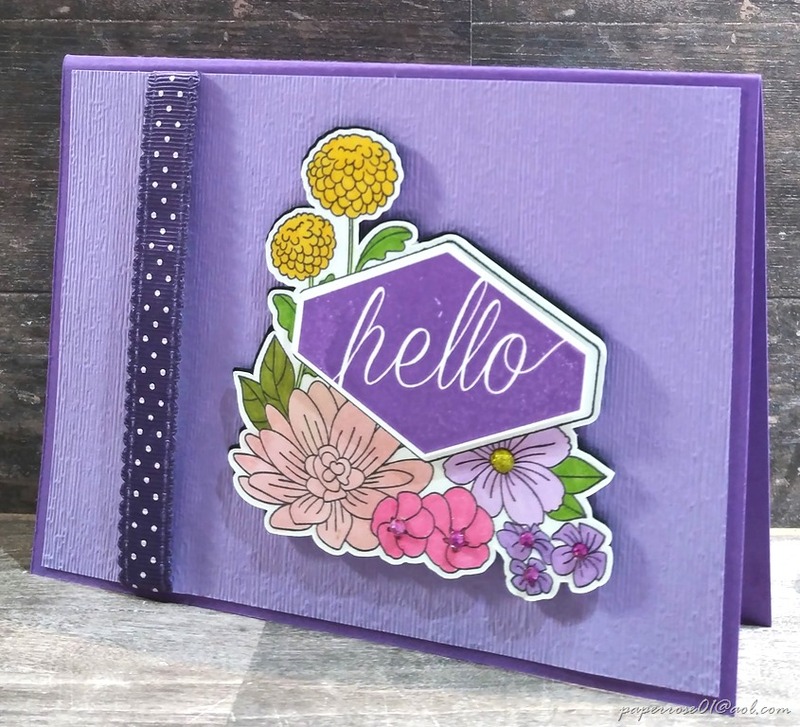 Accented Blooms is a pretty stamp set with lots of uses. It sells for $20 which I feel is quite reasonable. 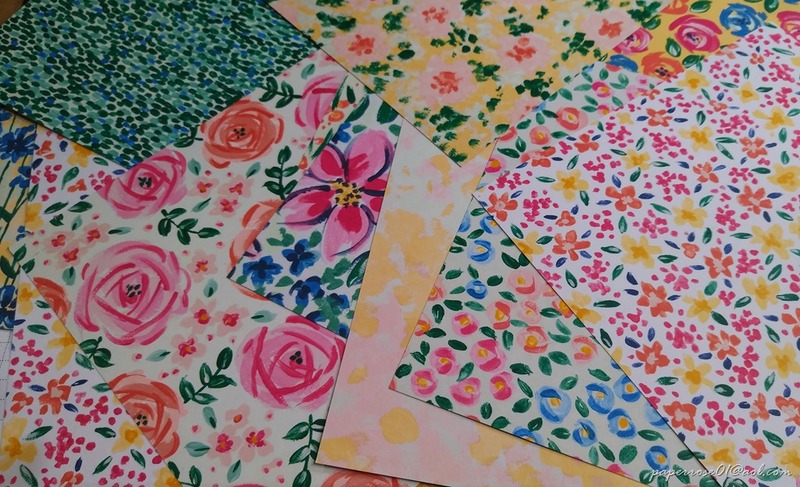 Because the flowers are colored with the Stampin’ Blends, you can choose to have your mini garden in shades of the same color, in pastels, fall, spring or even Christmas colors. My 100 year-old mother has even colored this image. Daughter Debbie designed this Gorgeous Grape and Highland Heather card. She stamped the image on Whisper White cs and cut it out with the Scan’n’Cut. She also saved the shape to the machine’s database so that a black matching can be cut allowing for the artwork to have a shadow. The colored artwork is mounted to the black outline and adhered to the Highland Heather card front with dimensionals. The Highland Heather layer has been embossed with the new, absolutely amazing Subtle embossing folder which gives a subtle, linen-like finish. Debbie added a “hello” sentiment in Gorgeous Grape and punched it out with the Tailored Tag Punch before adhering it to the open sentiment space on the image. 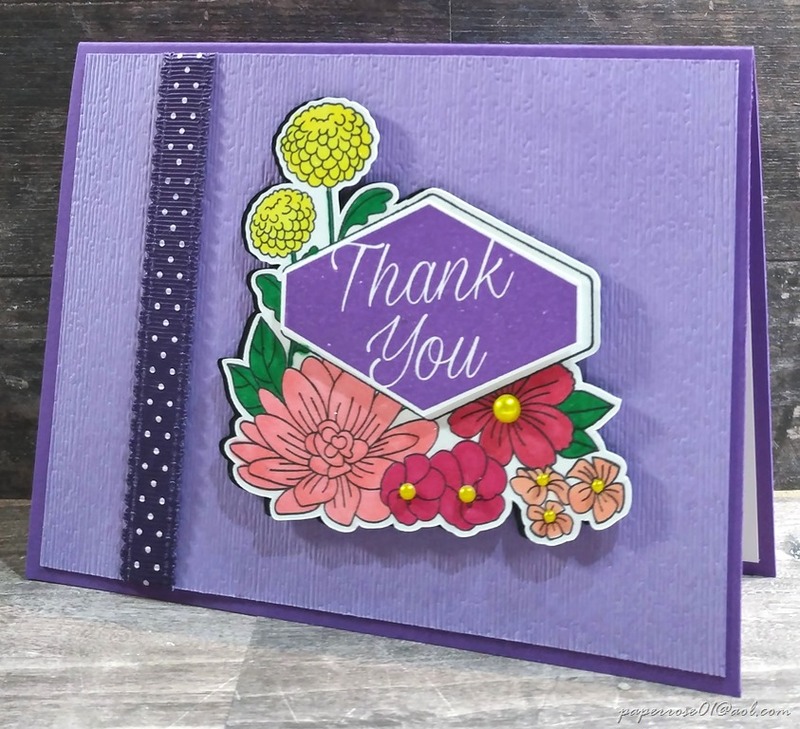 The second sample uses the “thank you” sentiment and different colors on the flowers. Our ribbon archives produced a retired dotted ribbon that goes perfectly with the card. Although hard to see, the first sample has colored rhinestones in the center of a few flowers. The second sample has colored pearls in the flower centers. Did you know you can color Stampin’Up rhinestones and pearls with Sharpie Permanent Markers. You’re rhinestones and pearls can be any color you wish. As a reminder, August Stamp Camp is Thursday August 2nd from 1-7 pm, Friday August 3rd from 2-7 pm and Saturday August 4th from 9 am – 4 pm. Mark you calendars now for September Stamp Camp – Fall will be the theme. Dates/times for September: Thursday Sept 6 from 1-7 pm, Friday Sept 7 from 2-7 pm, and Saturday Sept 8 from 9 am to 4 pm. We will continue doing 1 Christmas card at each monthly stamp camp. I love the woodsy effect of this card. Simply done in red, white and green with the woodsy Early Espresso, this is a card I would love to receive from a friend. 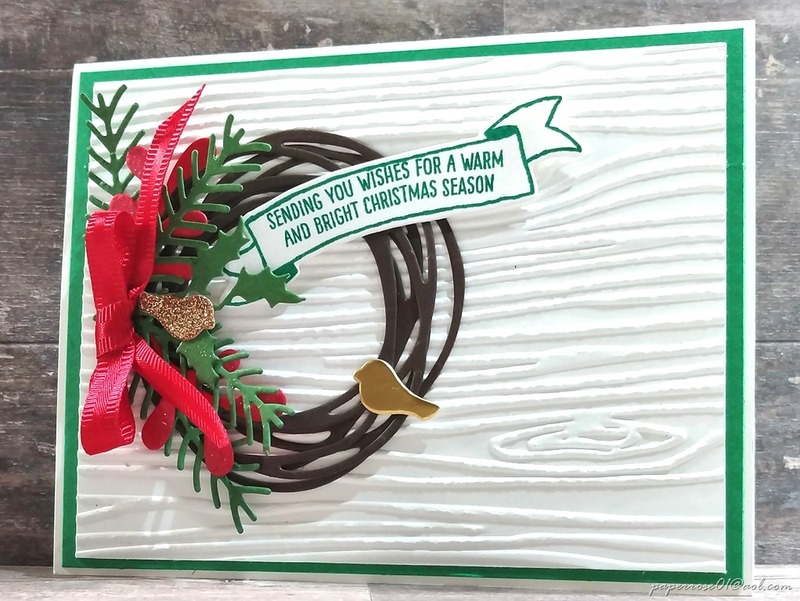 Although I have used a retired hardwood embossing folder for the top layer, the current Seaside embossing folder or even the Pinewood Planks folder would work well. 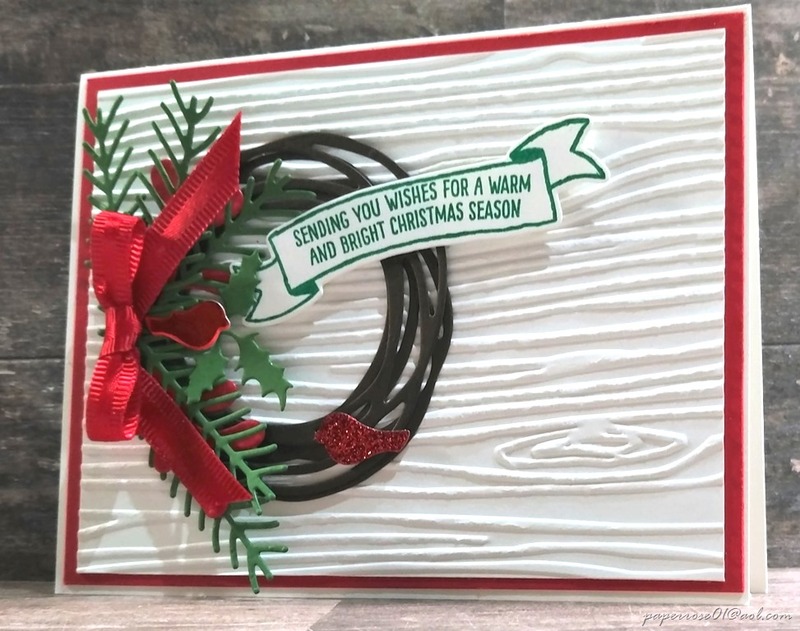 The wreath is die cut from the large Swirly Scribbles Thinlits circle. Two circles are cut and overlaid to give contrast and depth. The top of the wreath features several pine boughs and berry branches die cut from the Pretty Pines Thinlits. A simple red satin bow ties the boughs together and 2 little red birds – one red metallic and one red glimmer – perch on the finished wreath. Swirly Scribbles Christmas can be done on a Real Red or Call Me Clover layer as we see here. These little birds are die cut in gold – 1 metallic and one gold glimmer. The birds can also be die cut in silver. The sentiment is one I found in my Christmas library of leftovers and as there were multiples, I decided to use it. However, other messages can be stamped using the banner stamp and die. The wreath leaves a lot of room for interpretation. Perhaps your wreath will look much different from mine! As a reminder, August Stamp Camp is from 1-7 PM on Thursday August 2, from 2-7 PM on Friday August 3, and from 9AM to 4 PM on Saturday August 4. It is helpful if you can let me know when you might be coming. One more card to post – it will be up in a few minutes. Having less than 2 weeks between Christmas in July and August Stamp Camp put me in a bit of a panic! I had 3 cards planned out but what about card 4? When push comes to shove, reach for the two-sided Designer Series Paper (DSP). 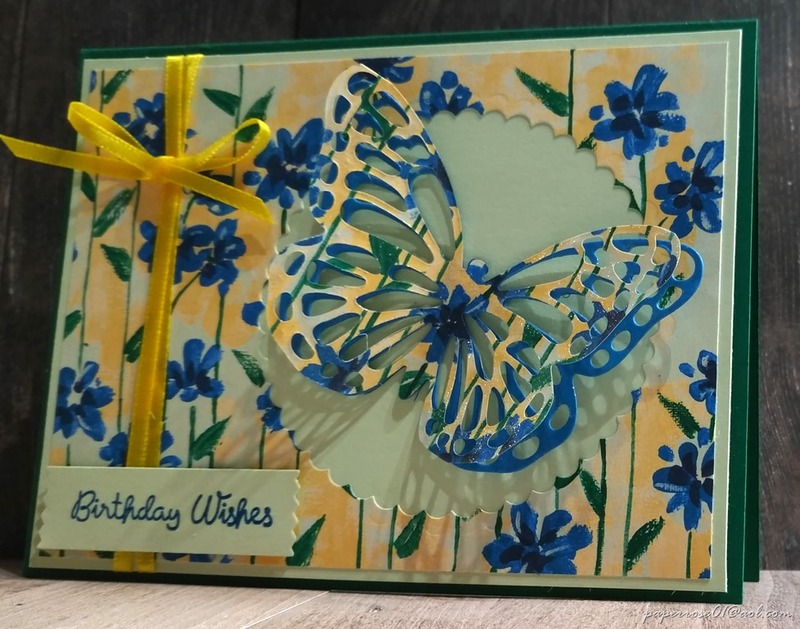 With the help of Garden Impressions 6 X 6 DSP, the Garden Butterfly card was born! The new colors Shaded Spruce and Soft Sea Foam work well with the DSP for the card and top layer. I chose this cheerful Pacific Point and So Saffron print. A large scalloped circle was cut from the DSP allowing the Soft Sea Foam layer to show thru. The butterfly dies are long retired but still product beautiful results. 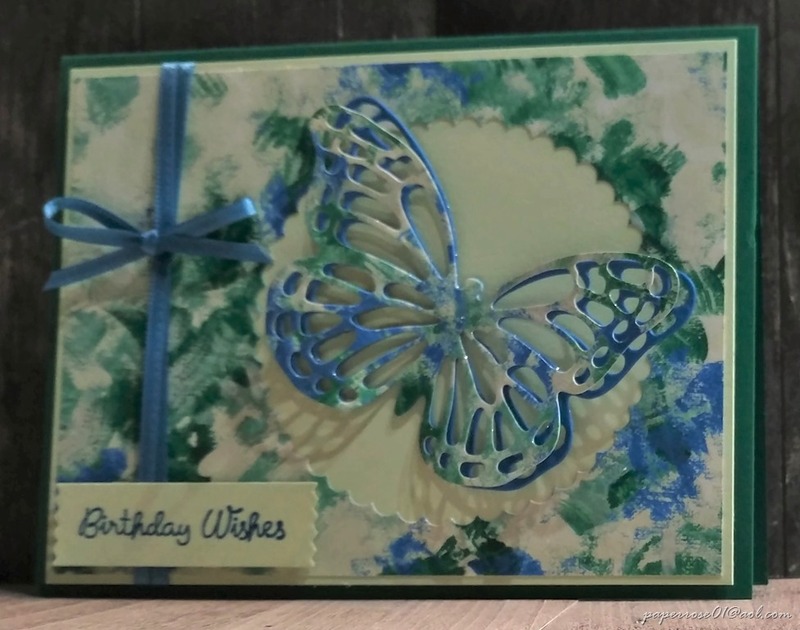 For this card, a butterfly of the DSP was layered on a Pacific Point butterfly; both were brushed with Wink of Stella. A cheery yellow bow was attached along with a Birthday Wishes sentiment from the Varied Bases set. I realize not everyone loves flowers the way I do. When you flip the flower side of the Garden Impressions DSP over, you find a non-flower but still beautiful design. You can combine the 2 sides by having a layer of one side and a butterfly of the other. Or, you can keep them the same as I have on these 2 cards. As shown above, there are many beautiful patterns of the Garden Impressions DSP. I will be taking pictures of the last 2 cards in the morning so the last 2 blog posts will come out tomorrow. Don’t forget to let me know if you will be coming to August Stamp Camp. Our 4th project will be a Christmas card. Let me know if you have any questions or concerns. 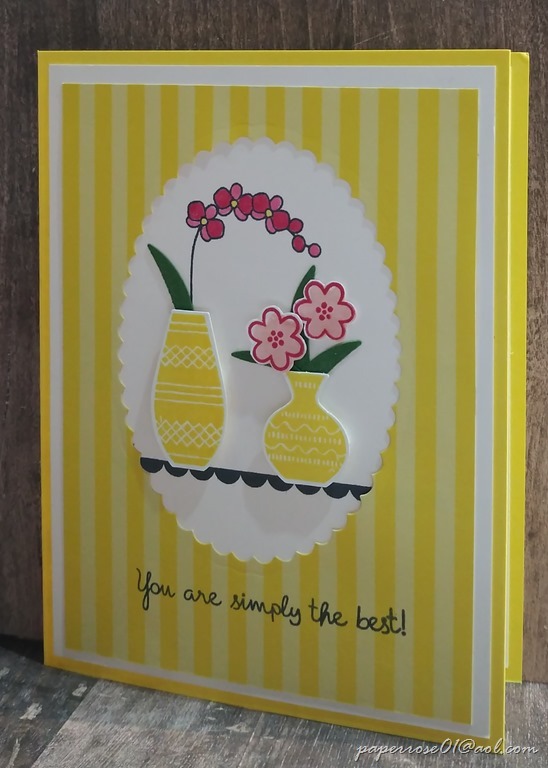 Varied Bases is a cute bundle I purchased from the new 2018-2019 Stampin’Up catalog. The bundle includes a punch which cuts out 3 different vases, the little leaf shown here and the tulip flower. There are lots of stamps so you can come up with lots of combinations. I used the new 2018-2020 In-Color DSP which comes in the handy 6 X 6 size. The new In-Colors are Lovely Lipstick, Grapefruit Grove which is shown here, Pineapple Punch, Call Me Clover, and Blueberry Bushel. The Stamparatus is set up to stamp the shelf and orchids in black, and the reverse side of the plate is set to stamp the 2 vases in a light color to serve as placement markers. 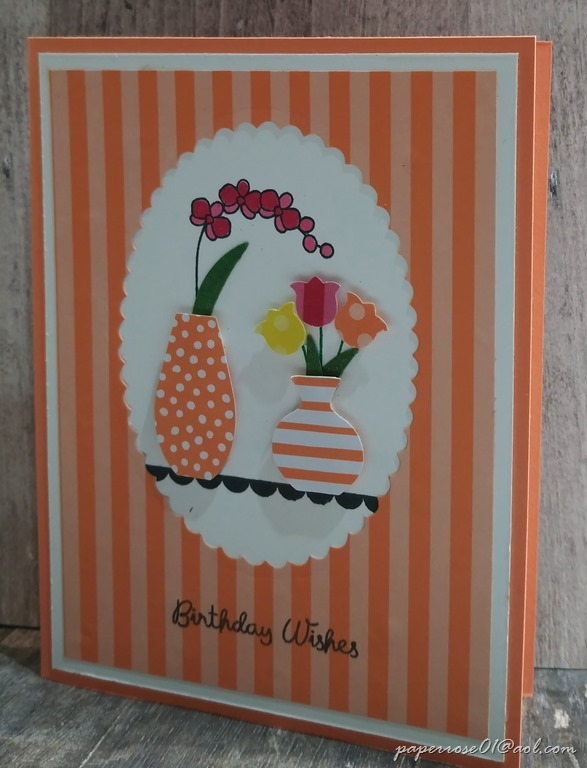 The Grapefruit Grove card has vases punched in 2 of the 4 available patterns in the 6 X 6 In Color DSP package. The tulips are punched in Grapefruit Grove, Lovely Lipstick and Pineapple Punch. The leaves are punched in Garden Green and adhere with Tombo Mono Adhesive. The stamped orchids are colored with the Stampin’ Blends in light and dark Lovely Lipstick. Wink of Stella adds glimmer. 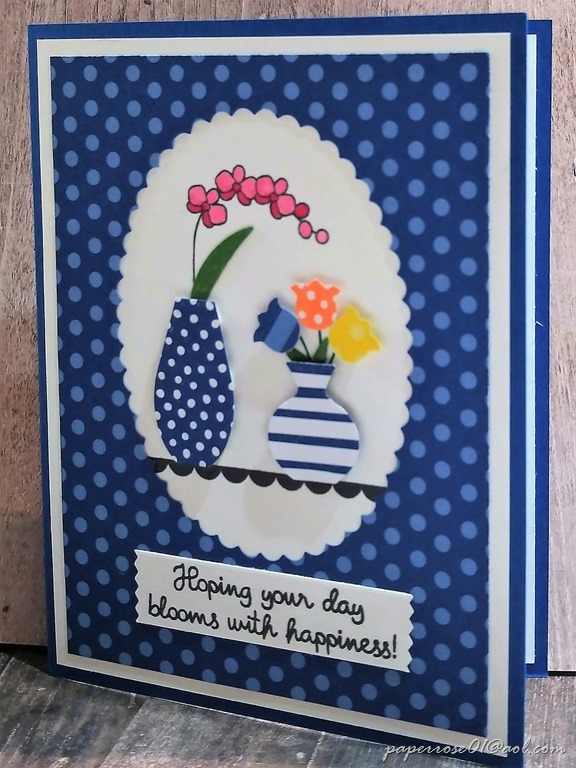 The Blueberry Bushel card shown here is very similar to the Grapefruit Grove version. I attempted stamping the verse on the card but the DSP was too dark. The retired washi tape punch came to the rescue and punched a legible sentiment. The Pineapple Punch card features vases that were stamped in Pineapple Punch on Whisper White and then punched out. I attempted to stamp a stem of flowers in the second vase, but the ink smudged. As I strive to always make lemonade out of lemons, I covered the mistake with 3 punched leaves and 2 fussy cut flowers stamped in Blushing Bride and Lovely Lipstick. Two other colors will be available for you at August Stamp Camp – Lovely Lipstick and Call Me Clover. After you choose your DSP, we will cut it to size, die cut the scalloped oval, and use the Stamparatus to help stamp the shelf, orchids, and vase placement. This makes such a cheerful card. August Stamp Camp is right around the corner – Thursday, August 2 from 1 – 7 pm, Friday, August 3 from 2 – 7 pm, and Saturday, August 4 from 9 am – 4 pm. We will be making Varied Vases, Accented Blooms, Garden Butterfly, and Swirly Scribbles Christmas. The cost is $12 for 4 cards and $2.50 for each additional card. Please let me know if you plan on attending August Stamp Camp. Knowing in advance how many are coming helps when in comes to cutting card stock.